Ok, now we get to the real stuff that no one tells you. Let’s say you’re using Quark or InDesign, you’ve flowed all the text of your novel or stories into the pages, and you’re done, right? It’s a bit like you just pulled your cake out of the oven, but you haven’t even started to frost it or decorate. And just like with cake, frosting isn’t just some frivolity. It’s an expected part of the cake-eating experience. And as anyone who has looked at the Cake Wrecks website knows, there’s a huge difference between a well done professional frosting job and a crappy one (whether amateur or not). A book is the same. If the frosting is applied by someone who doesn’t know what they’re doing, you end up with the titles in Papyrus or Comic Sans–or worse, the body text of the stories…! And that’s just the beginning. First let’s talk about FOUR types of pages you have to design. No. 1 is easy. When we say blank we mean no design elements at all. The copyright page, for example, should be blank, which is to say free of headers, page numbers, or other design elements. That means if you have a running header on your No. 3 style of page that has the author name or title of the book, it should NOT appear on your copyright page. ALL PAGES that are not specifically a chapter opener or a flowing text of story/main content should be BLANK. Title page, acknowledgements, dedication, copyright page, “also by…”, and other front matter pages of that type should be blank. In the back matter, thing like advertising pages should also be blank. The placement of that chapter title should have at least an inch of white space above it and at least an inch before the paragraph of the actual text starts. And usually the only acceptable place for the page number to appear in that design is centered at the bottom of the page. No header should appear above the title, no page number or running head like one finds on the main pages of the book. If you are going to use drop caps, let me tell you now: when you do that you don’t indent. Mixing drop caps with first line indents is like mixing plaids and prints. It’s one or the other, not both, please. Yes, the above is an example from an actual book on my desk. 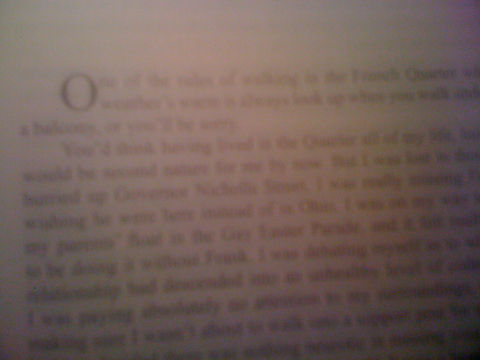 Great book (I’ve made it blurry so hopefully you can’t tell what it is) but clearly typeset by someone who didn’t know the rules. No. 3, the main pages of the book, are ALL pages that aren’t blank or chapter openers. These pages contain any actual content, including the introduction or foreword, and all the pages of the various stories or chapters except the chapter opening pages. That means if the author’s bio is only one page long, then it gets a chapter opening page and that’s it. Whereas if it runs to two pages, page one is a chapter opening page and page two is a No. 3 style page. No. 3 style pages are actually TWO styles of page though. One right facing, and one left facing. Quark and Indesign will keep track of which side of the page you are on if you have set them to “facing pages.” A basic fact of printed books is that the paper comes with two sides and there is no way around it. Typically the left facing page header will have the author name, the right will have the title, or vice versa, and the page numbers will be placed to mirror image each other (i.e. upper left corner on a left page, upper right corner on a right page). Next decision you have to make, do I start “New Right”? That means does each new story or chapter always start on a righthand page (aka “the recto”)? If so, then what happens if I have a chapter that ends on the recto? 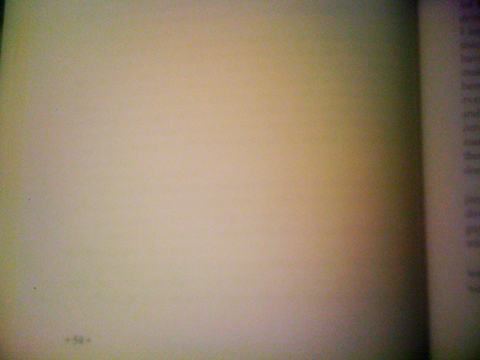 In order not to start the next one on the verso (left/reverse side of the paper), I must put in a blank page. That means a completely blank page, not a page with a lonely header sitting there by itself, or just a page number sitting there like a pimple. I see that a lot. YUCK. The page should be COMPLETELY BLANK, a No. 1 page. Then the next happy chapter starts on the recto. The above book has a lot of blank pages in it because the chapters open New Right. Every single one of the blank pages, though, isn’t blank. It’s got this lonely little number sitting there. Aghhhh…..
Make sure if you put in blank pages like this that your manufacturer knows you are intentionally leaving the pages blank! When you output a PDF to send to the manufacturer/printer, be sure you have set it to “Include Blank Pages.” Otherwise your carefully inserted blanks may disappear, your page numbers will get screwed up, and your left/right layout will be munged. There are only two reasons you wouldn’t start everything new right. One is that you’re actually making a digital PDF for sale and a blank page just makes no sense if the reader is just reading off the computer screen one page at a time and not seeing left/right spreads. The other is if you need to save money and the finished book comes out a few pages too long. Each page you cut saves you money. This is less urgent in POD where they can do any page count divisible by two. In traditional printing, it’s vastly cheaper to print a 224 page book than a 232 page book, for example (but might be the same price for 192 pages as for 224, because both require the same number of signatures). We haven’t even talked margins yet. The gutter margin (i.e. the margin on the page that is int he center of the two page spread — the right margin on the verso and the left margin on the recto) should be larger than the one on the outside edge of the page. The one on the outside edge of the page is there so you have a place to put your thumbs while reading the book that doesn’t cover any of the text. (This means on an ebook, you don’t need such big margins since the ereader device has the place to put your thumbs!) The thing is, you want the text to look centered, but in the gutter, where the pages are glued, because of the way the page bends, unless you are spiral binding or cracking the spine (ouch), you lose about a quarter inch to a half inch in the gutter. So if you want the margin to look like it’s a half inch all the way around, set the outside margin to half inch and the inside margin (on a paperback book) to 3/4 inch to correct for the gutter loss. Some printers (like Lulu and Lightning Source) may require a margin of a minimum size. Use their recommendation but don’t forget to add more to the gutter if they don’t remind you themselves.